Ahbir Sardin (left) murdered 14-year-old Venzel Richardson (right) in February 2014. COOK COUNTY CRIMINAL COURTHOUSE — A Chief Keef associate who raps under the name "D.Rose" was sentenced Tuesday to 40 years in prison for murdering 14-year-old Venzel Richardson in 2014. The boy was getting candy and chips with friends at a Woodlawn convenience store in the 6100 block of South Vernon Avenue on Feb. 12, 2014, when a white van pulled up, according to relatives and prosecutors. Ahbir "D.Rose" Sardin opened the van's driver's side door and began shooting — striking Venzel four times, authorities said. The boy ran to a nearby gangway, where he died of his injuries. A trail of blood-stained snow was visible the following day. Sardin, now 20, was convicted of first-degree murder in September. On Tuesday, Cook County Judge Thomas V. Gainer Jr. sentenced Sardin to 40 years in prison. According to sources, Sardin goes by the name "D.Rose" and appears in songs and videos by Chief Keef, RondoNumbaNine and Cdai. Sardin is a member of the Black Disciples street gang and has the number "600" tattooed on his wrist, police said. That tattoo sometimes refers to the Black Disciples. 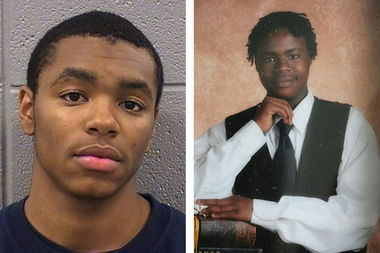 Sardin was previously falsely tied to the high-profile 2012 slaying of Chicago rapper Lil JoJo, whose real name was Joseph Coleman. Venzel's family said the 14-year-old boy was a freshman at Dunbar Vocational Career Academy. He played football and dreamed of making varsity. At home, Venzel loved to play video games and make short videos with friends. "I never wanted to be like the mothers on TV that are crying because their babies got shot," Venzel's mom, Laveta Richardson, said after the shooting. "And now I'm a victim. They shot my baby in the head." Venzel was the youngest of Richardson's three sons.